Wall-to-wall carpeting fills the floor area with pattern, color, and texture. An area rug is an accessory that defines a special spot in a room. Both can be used to update a room. Sometimes, just changing your floor covering can give a room a whole new look. Carpeting has many advantages. When properly padded, it’s extremely comfortable and among the least expensive floorcoverings. As if that weren’t enough, carpeting muffles noise and doubles as a sound controller. Carpeting can assume either a very laid-back or a very in-your-face role. If you pick a show-off pattern, keep the upholstery and window treatments in a solid or all-over pattern or texture that doesn’t compete with the carpeting. Commercial-grade carpeting is slightly more expensive than residential-grade carpeting, but it’s well worth the price if you intend to keep it for a long time. Don’t use ordinary carpeting in baths and kitchens. Look for bathroom carpeting (which can be laundered) and kitchen carpeting (which doesn’t allow water to pass through to the floor beneath). If you’re happier scrubbing hard-wear areas, combining kitchen carpeting in the kitchen/dining area with ceramic or vinyl tile in a sink and stove work area can be a great idea. Be sure to use the correct padding with the carpeting you choose. Ask the salesperson for guidance in choosing the right one. And, to protect your investment, ask your carpet dealer about a stain-resistant protective coating to prolong your carpet’s life. Rugs come in many different sizes. But generally, a rug covers most of the floor, while an area rug defines a smaller area. 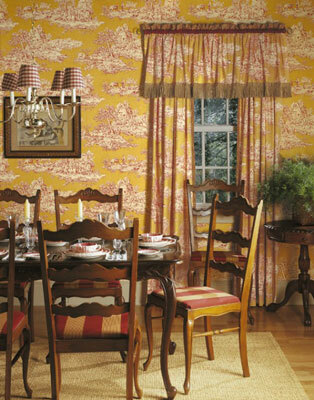 Wood and carpeting or wood and an area rug are great for a dining room. Generally, the busier a wallcovering, the quieter the floor. Rugs are manufactured in several different ways: machine-made, handmade, and homemade. Machine-made rugs are the most plentiful and least expensive. Handmade rugs are costly but may increase in value over time. Homemade rugs have tremendous charm perfect for Country and Cottage interiors.